The BEST French toast is bite sized and so much fun to eat! 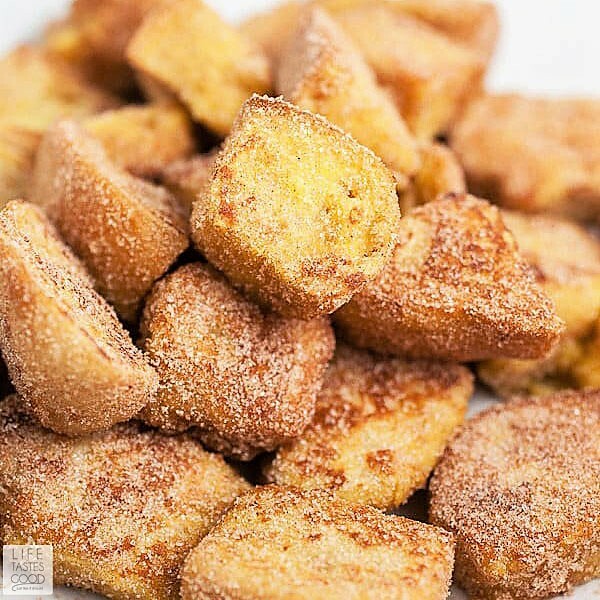 Cinnamon French Toast Bites are a perfectly sweet treat that's easy to make and eat! Great for dipping! I’m a huge fan of breakfast-y items like pancakes, waffles, muffins, and French toast. Especially with a big cup of hot coffee. When we think of foods like this we tend to think of them in their traditional forms – Stacks of fluffy pancakes, Belgian waffles, freshly baked muffins, etc... But, sometimes it’s fun to mix it up a little and change the form. 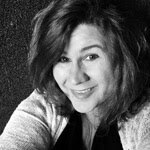 WHAT ARE FRENCH TOAST BITES? 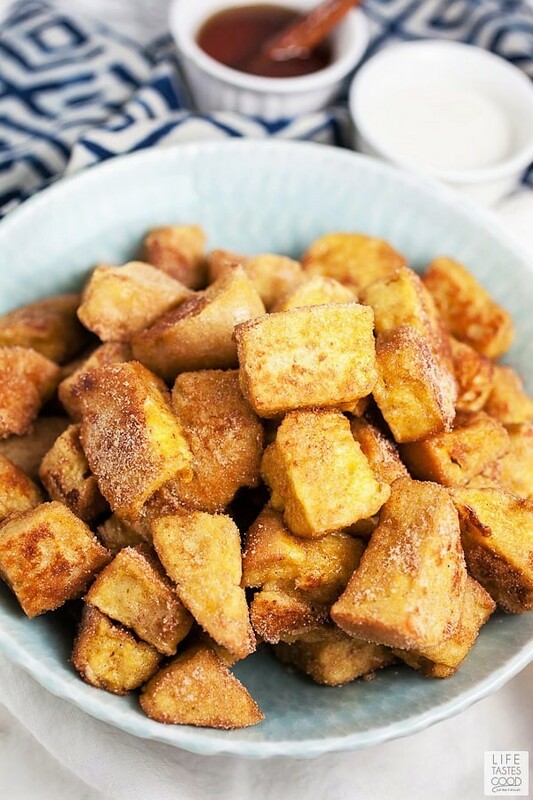 These Cinnamon French Toast Bites are the perfect way to mix things up! These tasty little bites are everything we love about French toast – They’re golden and buttery, soft on the inside and a little crunchy on the outside, have the perfect balance of cinnamon and sugar, and taste great with maple syrup. 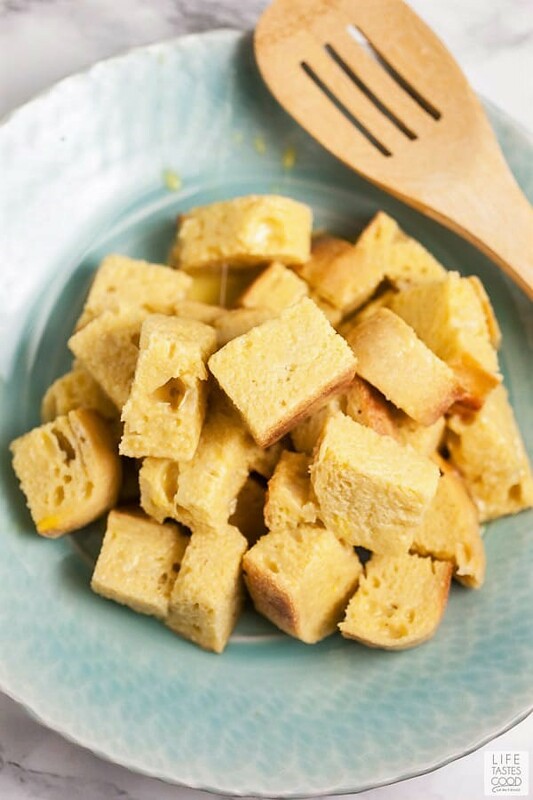 Instead of using whole slices of bread like traditional French toast, the bread is cut into bite-size pieces and sauteed stir-fry style. The bites are then dipped into a cinnamon-infused maple dipping sauce. These bites prove that mixing it up every now and then is totally worth it! Whip up the egg mixture that is used to coat the bread chunks. This is a super easy mixture! Crack 4 eggs into a mixing bowl and whisk them together completely. Add 3/4 cup of milk or heavy whipping cream along with 1 tsp. of vanilla extract. Mix these ingredients into the eggs until completely combined. 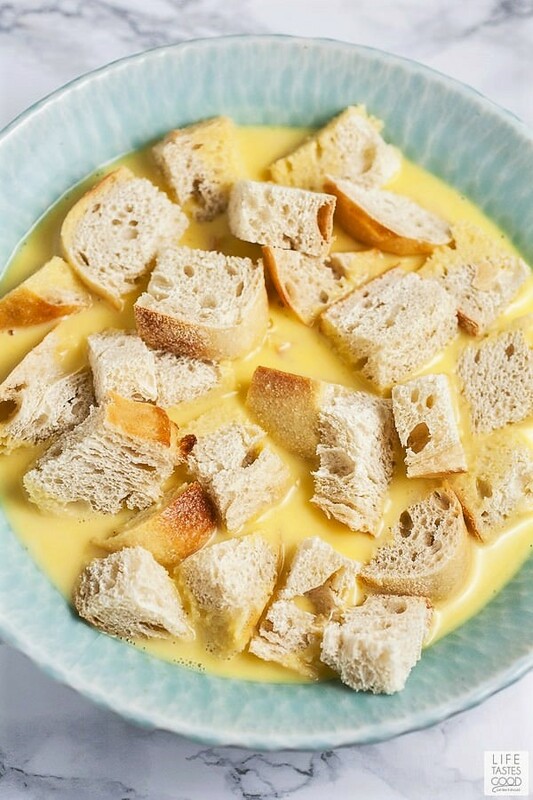 Place half of the bread chunks into the bowl and mix them around until completely coated. Once the bread chunks are coated in the egg mixture remove them and place them in another bowl. You don’t want the bread to become completely saturated – They should stay in the egg mixture just until coated. Coat the first half of the bread, set it aside, and then coat the second batch. This will ensure that it all gets evenly coated. 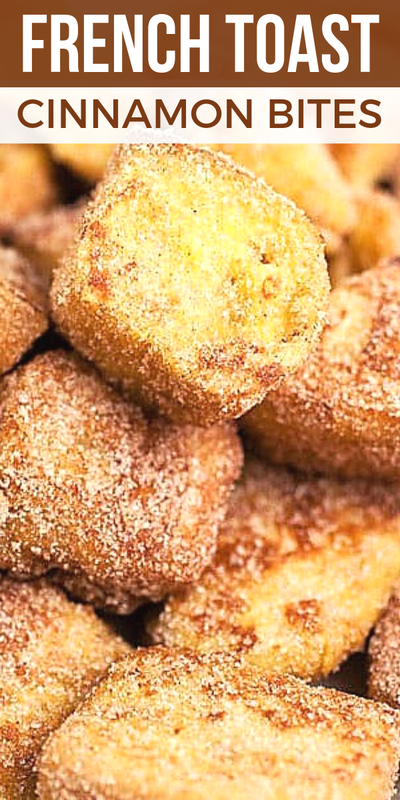 The Cinnamon French Toast Bites get fried in batches as well. Frying them in batches allows each piece to cook evenly so each bite is nice and golden brown. Start by placing a skillet on the stove top and heating it to slightly less than medium. Add 1 Tbsp. of butter or ghee to the pan. Once the butter is melted add the first half of the bread. Cook the bread for 2-3 minutes on the first side or until it starts to brown. Flip each piece of bread over and repeat on the second side. Once the bread is toasted on both sides feel free to toss it around in the pan. It is finished ‘stir-fry’ style. Remove the first batch of bread from the pan and repeat the process. Add another Tbsp. of butter or ghee and cook the second half of the bread chunks. Remove that batch from the pan when finished. Now for the good stuff! 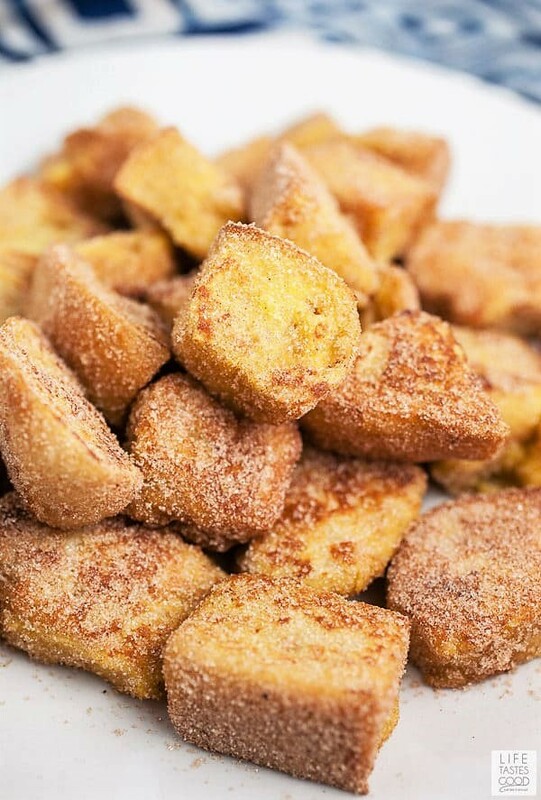 These French toast bites get tossed in a cinnamon sugar mixture that sends them over the top. Simply combine 3/4 cup sugar and 2 tsp. cinnamon in a bowl. Stir until completely combined. Add the toasted bread chunks to the cinnamon/sugar mixture and toss them around until coated. This will need to be completed in batches as well – Once the first batch is coated remove and place on a serving tray. Repeat with the remainder of the bread. TIP: It’s best to do this while the bread is still warm. The cinnamon and sugar will then stick to those warm, buttery bread chunks! 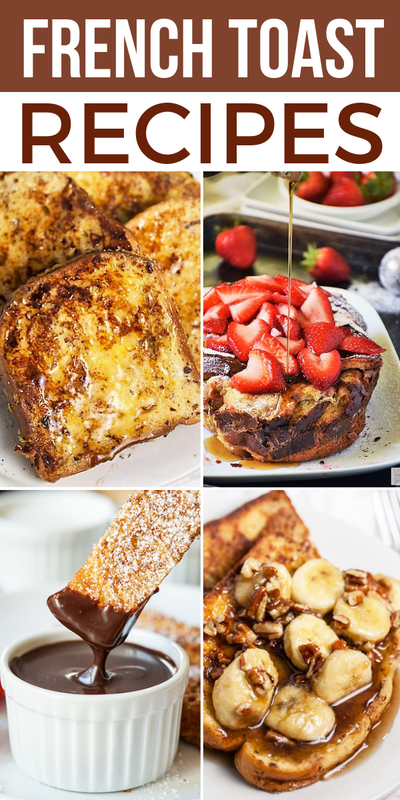 What is the best bread to use for French Toast Bites? The key to these Cinnamon French Toast Bites is to use a nice hearty loaf of bread. It’s best to choose a thick bread with substance such as an Italian loaf or something like brioche or challah bread. This recipe is a GREAT way to use up a loaf of bread that is starting to dry out. 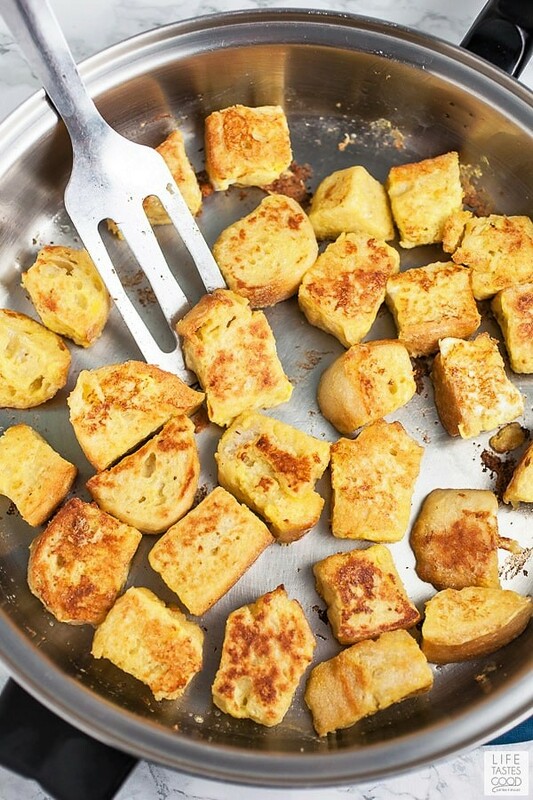 Slightly stale or oven-dried bread is always best when making french toast bites. What would these French toast bites be without a couple of dipping sauces? Maple syrup is classic for recipes like this one. To amp the maple syrup up a bit I thought it would be fun to serve it heated with a cinnamon stick. Cinnamon Maple Dipping Sauce: Pour 3/4 cup maple syrup into a small sauce pan and heat it on the stove top to medium-low. Add a cinnamon stick or 1 tsp. cinnamon and heat for 5 minutes or so. Powdered Sugar Dipping Sauce: To make this recipe more of a ‘dessert’ you can prepare a powdered sugar dipping sauce by adding 1 cup of powdered sugar to a small bowl along with 2 Tbsp. of water and 1 tsp. of vanilla extract. This will create a sticky sweet glaze. 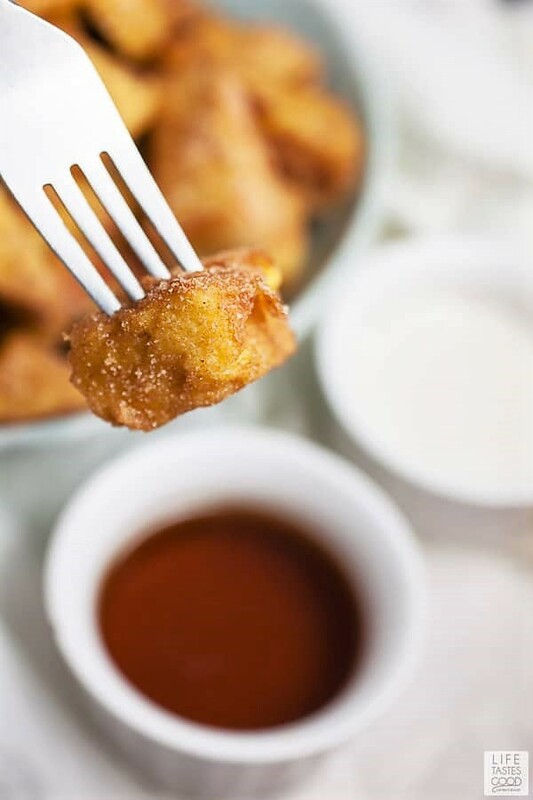 Feel free to serve these Cinnamon French Toast Bites with one or both sauces. The combination of the buttery cinnamon toast bites along with the cinnamon-infused maple syrup creates a rich flavor profile that everyone will love! For a more decadent dipping sauce, try one of the sauces we suggest for our French Toast Sticks. Cinnamon French Toast Bites is a great recipe to serve to guests over the holidays or in a brunch buffet. They’re a little bit ‘breakfast’ and a little bit ‘dessert’. There’s one thing for sure – These bites are totally addicting! Most home cooks will already have many of the tools needed to make this recipe, but for your convenience I've listed the tools I use when making Cinnamon French Toast Bites. Just click on the item name and find the product I use on Amazon. Heat oven to 350 degrees (if bread is fresh and needs to be dried out). 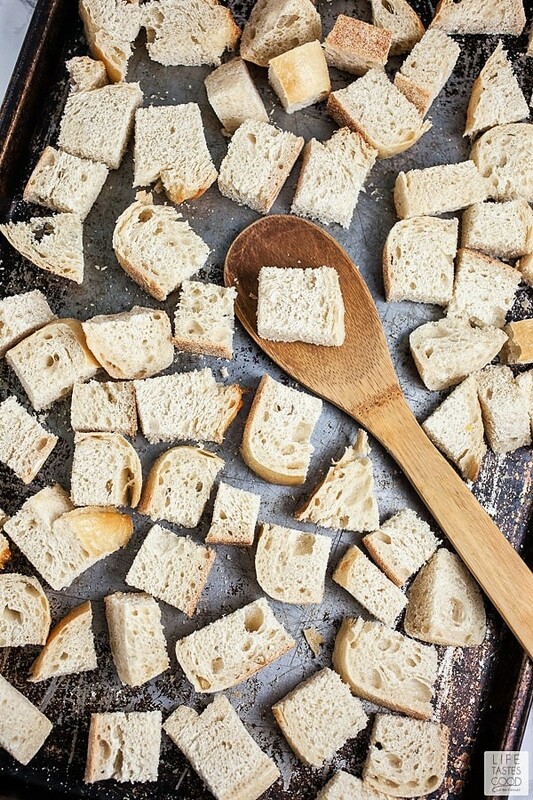 Cut a hearty loaf of bread such as an Italian loaf, brioche, or challah into bite-size chunks. It's best to use a loaf of bread that is starting to dry out. If bread is too soft and needs to be dried out a bit place the bread chunks on a baking sheet. Place the baking sheet in the oven for 5-8 minutes. Remove the bread once it is slightly toasted. In a large mixing bowl combine 4 eggs, 3/4 cup milk or heavy cream, and 1 tsp. vanilla extract. Mix until completely combined. Add half of the bread cubes to the egg mixture. Stir them into the egg mixture just until coated and then remove and set them in another bowl. Repeat with the remainder of the bread cubes. (The bread should be coated in the egg mixture and not saturated). Heat a skillet to just below medium on the stove top. Melt 1 Tbsp. of butter in the skillet. Once the butter is melted add half of the coated bread cubes to the pan. Cook for 2-3 minutes on the first side or until golden brown. Flip the bread cubes over and repeat on the second side. Feel free to toss them around in the pan 'stir-fry' style. Remove the first batch of toasted bread and set aside. Repeat with the second half of the bread cubes. Melt another Tbsp. of butter in the pan, add the bread and toast on both sides until golden. Remove from pan when finished. Combine 3/4 cup sugar and 2 tsp. cinnamon in a bowl. Mix until combined. Add the toasted bread cubes to the cinnamon/sugar mixture in batches until they are all coated in the mixture. Place on a serving tray. For The Maple Cinnamon Dipping Sauce: Heat 3/4 cup maple syrup in a small sauce pan on medium-low. Add 1 cinnamon stick or 1 tsp. cinnamon to the pan. Heat for 5 minutes or so, stirring occasionally. For The Powdered Sugar Glaze: Combine 1 cup powdered sugar, 2 Tbsp. water, and 1 tsp. vanilla extract in a small bowl. Stir until the mixture becomes a glaze.